Mischievous, affectionate, care-free and exasperating; that's the Lakeland Terrier! The Lakeland Terrier traces its origins to the late 1800s. The breed is closely related to Bedlington and Dandie Dinmont Terriers, and hales from the Cumberland, England near the Scottish border. Lakelands were originally bred to kill fox and vermin that preyed on the farmers' newborn lambs. This explains why the breed can be so tenacious because they often had to enter their quarry's lair in order to accomplish the mission. Lakelands are sturdily built, probably due to the rugged terrain they had to cover in the early days of the breed. Mighty but small, these dogs stand less than 15 inches high and weigh around 17 pounds. However, proportion is very important to the breed so the height to weight ratio varies slightly. The quintessential Terrier, the breed's outline is fairly square, with no exaggerated features. The head is rather rectangular with extra wiry fur on the muzzle for protection while working. The ears fold over into neat little "V"s. The neck is fairly long and blends smoothly into the dog's narrow, short-backed body. Like most Terriers, the tail set is very high on the rump and is typically docked so that the tip is the same height as the back of the dog's head when standing at attention. The legs are sturdy with good angulation in the rear to provide drive. These dogs almost look as through they are walking on their toes because their feet are tight and toned. Some dogs have a saddle color in a contrasting color or a grizzled mix of black through grey and one of the other solid colors. 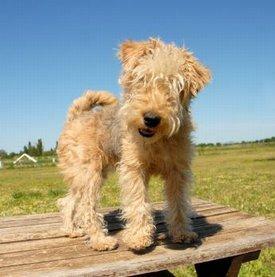 The Lakeland Terrier has a double coat that's harsh and wiry on the outside and soft and warm underneath. It often has a wave to it. Show specimens are generally stripped on the body, leaving the fur longer over the eyes and on the muzzle. The legs are trimmed to look neat and cylindrical. At home, pets are often clipped to keep them more manageable. Otherwise these dogs tend to take on a scruffy appearance, something that suits them just fine. If given proper exercise, the nails wear down naturally, but be sure to check if they need trimming. Otherwise, overgrown nails will spoil the dog's feet. Wipe out the ears once a week. Brush at least twice a week, especially if the dog has been in the field, so you can check for burrs and parasites. A monthly bath is usually sufficient since these dogs don't carry much body odor. High energy is a good way to begin describing this breed, but it doesn't quite tell the entire story. Lakelands are extremely intelligent and just as inquisitive. There is absolutely no shyness about them, and in fact, they can be quite cocky and self-assured. Enter a Lakeland's home, and he'll rush up to greet you and introduce himself. He'll then proceed to check you out thoroughly. On the whole, these dogs are very good natured, and very rarely aggressive towards people. However, they can be aggressive toward other dogs and pets in the home, so it's important to socialize them well. The Lakeland Terrier has a bold personality that makes him a natural leader. While this may be useful in the field, it can create a few problems at home. It is imperative that you establish yourself as this dog's rightful leader from the very beginning. These dogs can be as stubborn and willful as they are charming, so they are not a breed for the timid person. Training the Lakeland Terrier can be a challenge, not because this dog has difficulty learning, but because he tends to learn only that which interests him. Although obedience training is a must with this breed, they do not take readily to being told what to do. It takes a good deal of patience and practice to teach them to routinely follow your commands, and don't be surprised if your Lakeland takes a moment to think about your "request" before he decides to accommodate you. House training is another sore spot with this breed, and with Terriers in general. These dogs feel a need to mark their territory and often just don't seem to understand the need to go outside to relieve themselves. That's not to say you can't house train them, but it requires more consistency and determination than the average dog. As mentioned earlier, Lakelands have a lot of energy, and they need an outlet for it or else they can become a bit destructive tearing things up around the house. If you don't work your dog in the field, at least take him for a good jog or fast walk everyday. This will help him burn off some of that excess energy and make him a bit more manageable at home. Fun-loving by nature, you can often teach these dogs to appreciate a good game of Frisbee or tug. Some even enjoy participating in fly ball and agility, but don't be surprised when something else suddenly catches their interest and they fly off track. It's simply in their buoyant nature to act on the opportunities that present themselves. The Lakeland is a lot of dog in a small package. Research the breed well and make sure you're up for the challenge if you decide to bring one home.